The focus of the group lies on the control of optical, atomic and nanostructured quantum systems. Advance quantum effects in mesoscopical and macroscopical systems in order to fathom the transition from the quantum to the classical regime. on electronic noise and counting statistics applied to e.g. 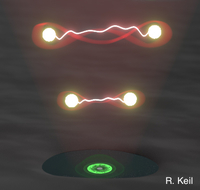 tunneling processes through quantum dots. 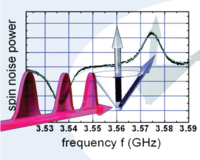 The group aims to bridge the gap between semiconductor photonics and advanced quantum optics. 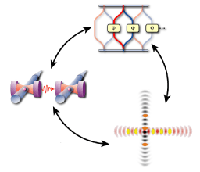 Non-classical photon states, such as single photons, entangled photon pairs and multiphoton states are prepared by the solid-state photonics devices, and then used as an important ingredient in a number of quantum technologies. The research group is located at the institute for quantum optics and investigates the properties of ultra cold atomic and molecular gases. Thereby the focus lies on the analysis and realization of dipolar complex quantum many body systems in quantum gases of ultra cold polar molecules. From the very beginnings of the field, the group is involved with quantum information theory, working on the fundamental conceptual and mathematical fundations of quantum theory.